The Hot Stone Grill is the new phenomenon in restaurant dining that is sweeping the UK. Now you can experience it in your own home thanks to Giles & Posner, the company that brought you the chocolate fountain! The Hot Stone Grill is creative cooking at its best; you can really taste the freshness of foods, or add your own spices and marinades for a fusion of flavours. Amaze your family and guests with the exceptional experience of the new Hot Stone Grill, allowing each person to cook meat and vegetables to suit their personal preference. The Stone’s high temperature seals in natural juices and nutrients without the need to use fats or oils providing a unique texture, taste and experience with added health benefits! Cook a variety of meats and vegetables on the Hot Stone, whilst grilling a selection of bread underneath for the perfect meal. The Stone seals and sizzles meats instantly keeping them moist and tender. Transfer cooked food directly to your plate, with no danger of overcooking or drying out. The Stone allows you to eat healthy fast food and in minutes. There is also a groove around the edge of the Stone to drain any natural fats as the meats are being cooked. The Hot Stone Grill is flexible; it can be used for a meal indoors or Al Fresco dining outdoors. It’s easy to clean, maintain and best of all simple to use. It comes complete with an inspirational recipe book full of delicious ideas, and a user guide. The Hot Stone Grill is just one of the new innovative food entertainment products in the EAT! Range from Giles & Posner; products that are ideal as a gift or party piece. To see other products in the range, to buy online or to find a stockist near you please check out www.gilesandposner.com. Distributors, please email sales@gilesandposner.com for wholesale prices and package deals. 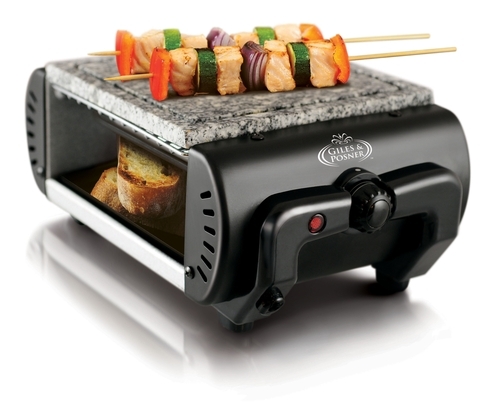 Giles & Posner’s New Hot Stone Grill retails at £24.95. This press release was distributed by ResponseSource Press Release Wire on behalf of Inspirational PR in the following categories: Children & Teenagers, Men's Interest, Health, Home & Garden, Women's Interest & Beauty, Food & Drink, Retail & Fashion, for more information visit https://pressreleasewire.responsesource.com/about.